Putting her Selkirk College education to work, student Eva Snyder completes important energy report on East Shore as part of a Teck Serv research project. Problems with power on the East Shore of Kootenay Lake has prompted a study that is now available online. The Rural Alternative Energy & Resiliency report is written by former Selkirk College student Eva Snyder and a product of research she conducted this past summer. 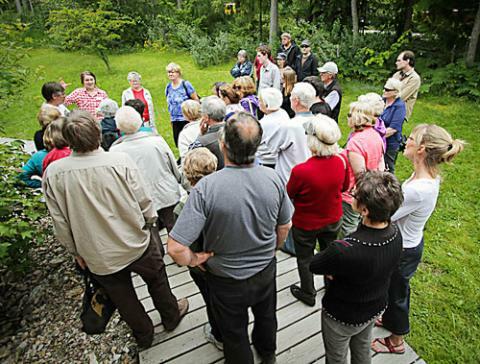 Former Selkirk College student Eva Snyder (far left in red) takes a group through the Yasodhara Ashram during her Teck Serv summer research project. The report is made possible through a partnership between Selkirk College, Yasodhara Ashram, the Columbia Basin Rural Development Institute (RDI), Teck Trail Operations and Community Connections. The study was a product of the Teck Serv program that provides Selkirk College students financial support to undertake a chosen community-based applied research project each summer. Snyder used the East Shore’s Yasodhara Ashram as a base for her research, evaluation and assessment. Using the residential and gathering buildings at the ashram to represent a model for a small community, Snyder conducted an energy assessment. Her assessment then allowed her to delve into both household and community level solutions to energy needs. Without the capacity for oil or natural gas on the East Shore, the study explored simple and accessible technology. Snyder investigated options such as micro hydro, photovoltaics (solar energy) and biomass. It’s those options that were discussed at a special evening at Gray Creek Hall in October. “There were barriers for some technologies and opportunities for others,” said Snyder. Snyder was mentored by Jayne Boys who is a teacher/trainer at Yasodhara Ashram. Boys said there has been a need for this study for some time and the ashram’s carbon neutral goals made it a perfect fit as the project base. Late last autumn the East Shore dealt with three lengthy power outages that caused hardships on both businesses and homeowners. One of the other end goals of the report is to pass the information onto the BC Ministry of Energy and Mines, and to share it with other rural areas around the province coping with similar energy issues. Snyder was enrolled in the Integrated Environmental Planning Program at Selkirk College in the 2012-13 school year. Last spring she also completed the six-week Advanced Certificate in Renewable Energy Technology Program on the Castlegar Campus. Through an application made by Crawford Bay-based Community Connections, Snyder was chosen under the Teck Serv program to undertake the study. The Teck Serv program is funded by Teck Trail Operations and is coordinated through the Columbia Basin Rural Development Institute at Selkirk College. Now working towards a degree in Geography at Langara College in Vancouver, Snyder said spending eight weeks applying her knowledge for the report is an important step in her education. Find out more information about the Teck Serv program—including information on the internship call for proposals—here. Learn more about the Columbia Basin Rural Development Institute and join us on Facebook.